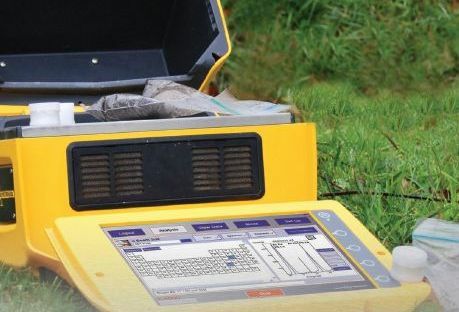 The X-5000 Mobile XRF System has lab-like EDXRF power and performance in a portable package: tube-based, closed-beam enclosure, on-board PC, large display and virtual keyboard. 28 pounds without battery, ideal for liquids, solids or powders for mobile labs or for at-line incoming/outgoing material inspections. For those who demand benchtop analytical power with the ease of portability, Olympus Innov-X offers the field-rugged, closed-beam X-5000 for on-site analysis in virtually any environment. The X-5000 offers true portability with a high level of power and performance; our advanced 3-beam (kV-mA-filter settings) method and the latest in detector technology - an innovative, large area Silicon Drift Detector (SDD), used and tested extensively in high-end laboratory based instrumentation. Use it as your primary XRF analyzer, your lab XRF back up, your screening tool or your field inspection XRF system. The X-5000 is offered with two different x-ray tube anode choices. 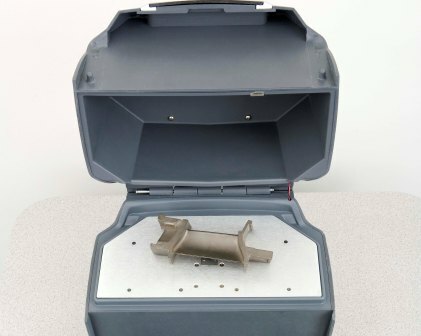 A tantalum (Ta) anode x-ray tube configuration is utilized for excellent sensitivity measuring 25+ transition metals including Cd, Ag, Au, Pb, Cr, and even Rare Earth Elements. A rhodium (Rh) anode configuration is offered when the application calls for optimized analysis of light elements including Al, Si, S, Mg and P, along with mid range transition metals. All X-5000 mobile systems are equipped with an industrial grade X-ray Fluorescence analyzer high resolution detector system (<165 eV FWHM at 5.95 keV Mn spectral line); 50 KeV, 10 W Tantalum X-ray Tube, Adjustable; Windows based Pentium Computer with pre-loaded analytical software; AC Adapter, User Manual, Quickstart Guide, 316 Stainless Steel standardization coupon and check standards (depending on mode); Rugged shipping/carrying case; Factory Authorized Radiation Safety Training & Start Up Assistance. The X-5000 can be configured with any or all of the following calibration modes: Soil, Mining, Alloy, Fluids and Consumer Goods. 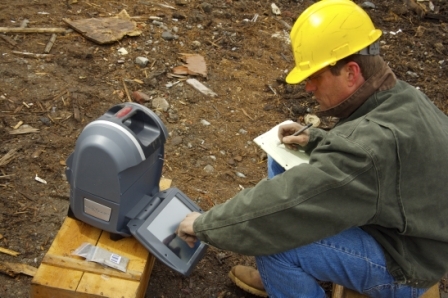 Portable XRF has completely revolutionized on-location analysis. 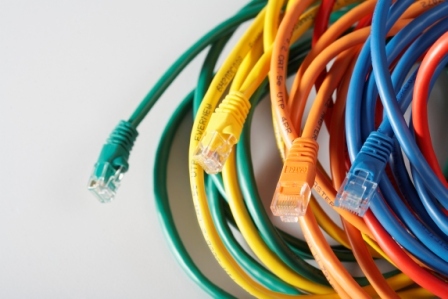 The number of samples that can be analyzed at the location needed dramatically reduces analytical costs; and, turnaround time is no longer a limiting factor. The X-5000 delivers qualitative or quantiative real-time elemental chemistry, right at the point of the sample location, where you need it most. Whether your analytical needs are motivated by regulations, quality control or immediate return on investment inspection, the X-5000 will perform for you.